PHOTO: Allen Ramsey, DWCPhoto.com. Highlands first baseman Joseph Martin (21) waits on a throw while McCracken County's Derek Schneider hustles down the line. Martin had two hits in Highlands' 5-2 win over the top-ranked Mustangs in the first round of the state tournament. PHOTO: Allen Ramsey, DWCPhoto.com. Highlands shortstop Jake Whitford (right) makes a play on the ball while Grayson Heck (left) backs him up. PHOTO: Allen Ramsey, DWCPhoto.com. Highlands senior Brady Murray takes a swing. LEXINGTON - The top ranking and undefeated record against Kentucky teams could have phased them. 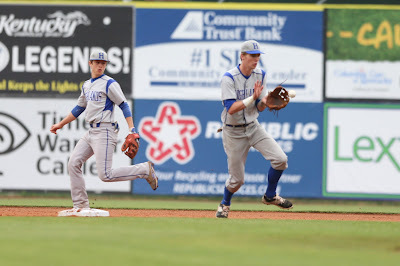 But the Highlands Bluebirds chose to put it aside and record the biggest win of the season, 5-2 over the McCracken County Mustangs in the first round of the Rawlings/Kentucky High School Athletic Association State Baseball Tournament on Tuesday at Whitaker Bank Ballpark. Highlands has won 13 in a row. Heavy rain Monday forced the game to be postponed to Tuesday Morning. The 20th-ranked bluebirds (33-6) take on the 18th-ranked North Bullitt Eagles (31-11) in the quarterfinals on Wednesday. Game time is 6 p.m.
"The limit is as high as (Wednesday)," said Jeremy Baioni, Highlands Head Coach. "That's how we're thinking. If you go to a tournament like this and you're looking ahead, you get left behind so we're thinking about (Wednesday). We're going to get prepared and see what we can do." The win snapped top-ranked McCracken County's 18-game winning streak. The Mustangs (33-3) entered the tournament 23-0 against Kentucky teams including wins over Louisville Trinity, Lexington Lafayette and Louisville Pleasure Ridge Park. Their only two losses came to Bartlett (Tennessee), a suburb of Memphis and semifinalist in Tennessee's largest Class AAA State Tournament. Highlands strung together nine hits against a McCracken County staff that entered the tournament with an astounding .95 earmed-run average. Todd Ramey led the Bluebirds going 3-for-4 with two doubles, a triple, one run batted in and a run scored. Teammate Joseph Martin went 2-for-3. "We realize when we come into big games like this, anything can happen so we have to be ready to play," Ramey said. "It doesn't matter what the other team's rank is, who they are or who they have. Anybody can beat anybody." Both teams committed three errors. But the Mustangs did not take advantage of any Bluebird errors while Highlands scored four unearned runs in the top of the fifth off two McCracken County errors making a huge difference in the game. The two McCracken County losses came as a result of a number of errors. "We told the guys to stick to it," Baioni said. "It's a seven-inning game. You might not get a hit in the first at-bat. But learn from it, take it to the next at-bat and get quality at-bats and we did. Our guys did a good job of learning and adjusting. Once we adjusted, we really hit a lot of balls hard and got bunts down. It wasn't about just getting bunts down. It was about getting them to the right location." Highlands starting pitcher Mitch Jones and reliever Ricky Raisor held the vaunted Mustang line-up to 3-for-27 for a .111 clip. Jones (8-2) struck out seven and walked none while Raisor struck out two and walked just one. "They came up swinging," Jones said. "They all hit one through nine. (Keeping the ball) low is the biggest thing I've been practicing all week. That was the best we could do. Obviously, it worked out to our advantage." The only extra-base hit for McCracken County came in the third inning when first baseman and 1st Region Player of the Year Ryan Garner landed a 2-0 pitch from Jones just inside the right field line scoring pinch-runner Cameron Langston and center fielder Daniel Seitzinger with two outs to give the Mustangs their only lead at 2-0. Highlands had one hit against Mustang ace pitcher Cole Womack (8-1) in each of the first four innings. But they did not score until tallying two in the same inning in the fifth. 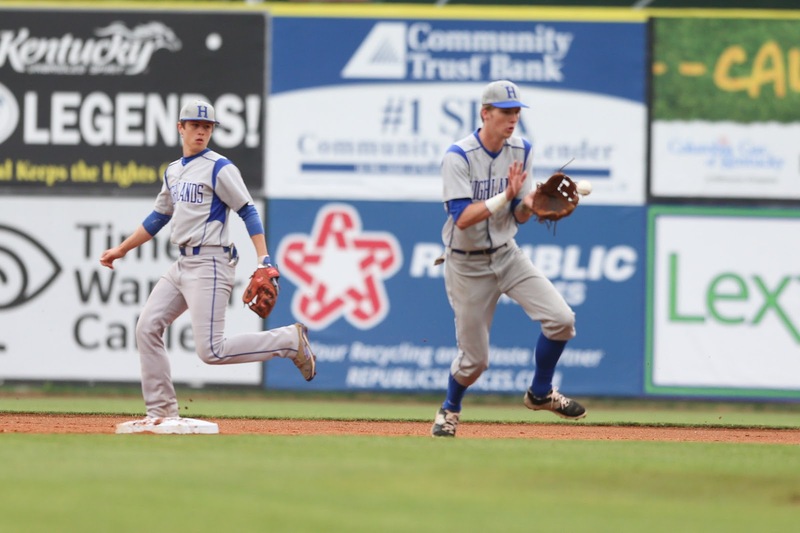 The rally began when Martin had an infield single and pinch-runner Bradley Greene took second when Womack hit Luke Hennigan with a pitch and Kyle Rust ran for Hennigan. That's when Grayson Heck laid down a bunt down the third-base line. But a wild throw allowed Greene to score and Rust to take third to cut the lead to 2-1. That brought Alex Veneman to the plate. He grounded out to third moving Heck to second. Highlands lead-off hitter Brady Murray then hit a ground ball to McCracken County second baseman Ian Walters. Walters threw home but Rust beat the throw to tie the game at 2-2 and Heck advanced to third. Highlands then caused more havoc with another bunt by Conner Kreeger. Another Mustang error allowed Heck to score and Murray to second still with just one out. Highlands lead 3-2 at that point and added its fourth run of the inning when Ramey doubled down the left field line to score Murray. The Mustangs threw Kreeger out at the plate. Highlands pitched out of jam in the bottom of the sixth. Keegan Breese reached on an error with one out for McCracken County and took second when Trent Shelby walked. Raisor came on and walked Derek Schneider to load the bases on a full count. The next batter in Pope Reid worked a full count before grounding out to Whitford at short to end the inning. "A lot of things were going through my mind," Raisor said. "When I went out there, all I could think about was throwing strikes, believing in my team, and just having faith and fun. (Then) good things will happen." The Bluebirds added an insurance run in the top of the seventh. With two out, Ramey tripled and Whitford singled him in. That made the final score of 5-2. Raisor retired the top of the McCracken County line-up in order in the seventh. He struck out Womack swinging, got Seitzinger to ground out to Martin at first unassisted and struck out Garner looking to end the game. The Eagles have been to the state tournament two years in a row winning the 6th Region. They drove to the state semifinals last year beating Elizabethtown (6-5) and Conner (4-3) to make the semifinals before losing 13-4 to eventual state champion Louisivlle St. Xavier. Baioni would not name a starter for the game. But the Bluebirds have options with Raisor, Martin or even Ethan Doty. "We have to discuss how everyone is feeling and what everyone is thinking," Baioni said. "We'll make a decision from there." North Bullitt batted .308 (337-1,093) as a team entering the tournament. Their leading hitter is third baseman Logan Wyatt. Wyatt was batting .461 (53-for-115) entering the tournament with 11 home runs, 12 doubles and a triple to go with 53 runs batted in and 43 runs scored. Ryan Henson (8-1) is North Bullitt's pitching ace. He has a 1.7 earned-run average in 66 innings pitched, 52 strikeouts, 50 hits, 20 walks and 16 earned runs. Henson threw a complete game in North Bullitt's 6-4 win over Hopkinsville on Monday. Hopkinsville led 3-0 in the first and 4-3 entering the bottom of the third before North Bullitt tied it in the first with three runs. The Eagles tied the game at 4-4 in the fourth before scoring twice in the fifth to win it. 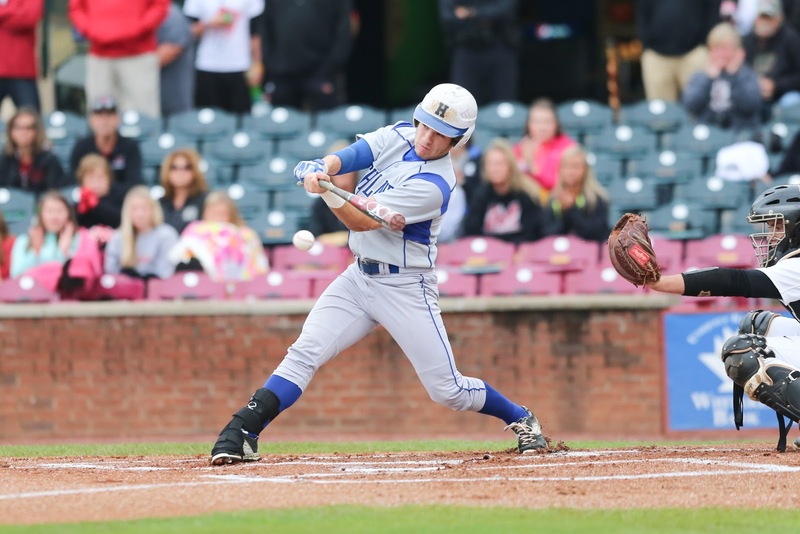 The Eagles recorded seven hits against Hopkinsville. First baseman Jacob Kelly led the way going 2-for-3 with a run scored. Designated hitter Chase McKenzie added a double for North Bullitt. The win Tuesday gave Highlands a state tournament history record of 2-3 with the only other win coming in the state quarterfinals in 1965. 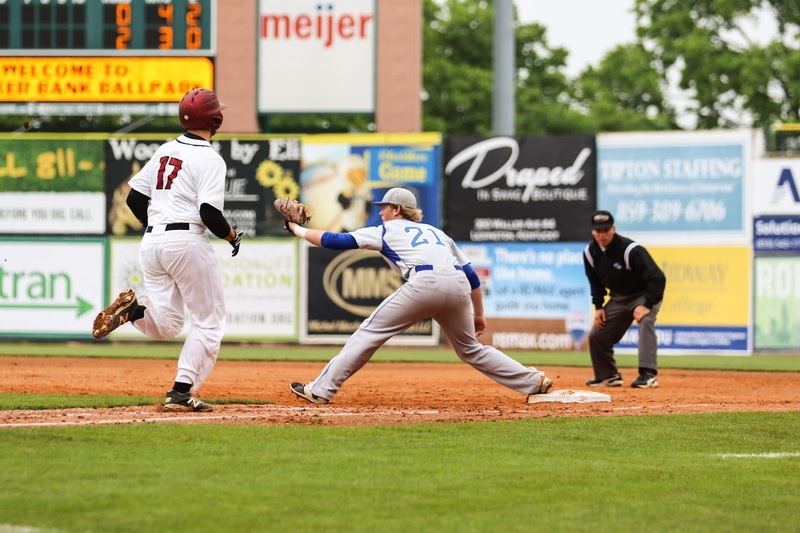 The Bluebirds beat Madison Central, 8-2 in the state quarterfinals that year before losing 4-3 to Louisville Fern Creek. Todd Ramey, 3-for-4, Two Doubles, Triple, One RBI, One run scored. Highlands (33-6) vs. North Bullitt (31-11), 6 p.m.
Collins (25-11) vs. Greenup County (32-10), 8:30 p.m.